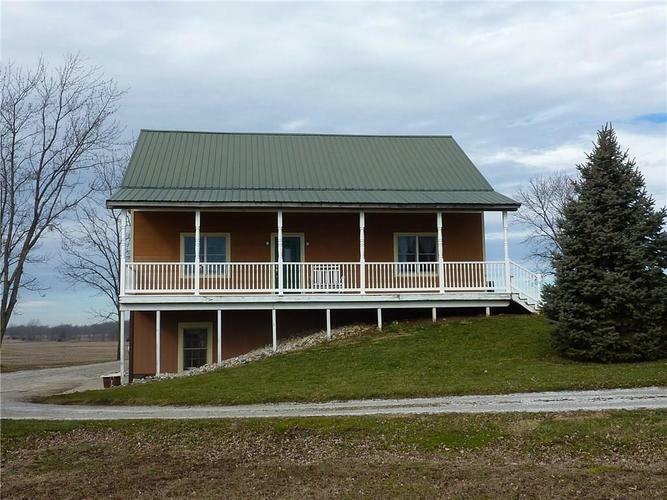 Fantastic timber frame home with walk-out basement on 1.61 acres with access to Hwy. 36. 3 BR, 2.5 bathrooms, loft with skylights, & open concept living room/dining room/kitchen. Lots of great outdoor space and beautiful views of open fields. Property includes pole barn garage/workshop and several smaller out-buildings. Convenient to Greencastle, Racoon Lake, or Danville/Avon. Home includes many different native wood species, Amish-made cabinets, & one-of-a-kind craftsmanship. Large versatile room in basement is plumbed for wet bar. All appliances included. Rooms in basement could be a great in-law quarters, guest suite or additional family room space. Two covered porches. Master suite with walk-in closet and private bathroom. Directions:From Greencastle, take 231 north to 36 and go west to Morton. Once in Morton, turn north on CR 490. Home is on left a very short distance up the road. Look for sign.